Following modern views about what really a measurement is, it also becomes possible to understand why they are unavoidable the Runt Triggerings. Triggerings on Runt pulses are not simply errors of the system, rather also hint to the reality of what happens on a smaller scale arena where and when Signals, of extremely brief duration and energy, super impose themselves. Interfering, sometimes contructively building up a spiked signal, some times destructively creating a hole in an other wise constant amplitude. A constant fluctuation around values looking us constant only because integrated along extended periods of time. Extended periods of time because of sampling rates inadequate to let us go closer to the reality. All technicians involved in Electronic Maintenance know that connecting an oscilloscope to a metal object, then setting a Time base like 1 millisecond, discloses a scenario of jitters and spikes, generically named noise. Due to the complexity the subject, in the following we’ll illustrate them by a massive use of figures. Its most relevant component induced by the mains power grid, easily recognized by its frequency of 50 Hz or 60 Hz. But, accessing a different kind of instrument, one capable to clock also pulses shorter than one attosecond ( 10-18 s), it becomes possible to witness what scientists started to see more than 60 years ago. Then, the arena of apparent noise starts to show a distinct pattern: average values, nearly constant along time, tend to disappear, replaced by irregular functions sporting discontinuities. Runt pulses are pulses that don’t reach a valid high or low level, meaning they’ll reach potentials intermediate between what are considered logic “High“ and “Low“ statuses. They appear for a variety of reasons, and are frequent in the harsh conditions of all of the Food and Beverage Bottling Lines. oxidation of the terminals where trigger sensor conductors are connected, implying false contacts of extremely brief duration. looking for signals that only cross one of them. Knowing what IO line, what Trigger, is introducing runt signals and setting a limit for their frequency, a limit related to the actual frequency of processed containers-per-hour, it becomes possible to make available to the Bottling Plant Staff extremely useful auto-diagnostics. Diagnostics pre-emptive with respect to permament fault statuses otherwise later affecting the entire Electronic Inspector and, from there, the entire Bottling Line. Trigger photosensors, using LASER sources and detectors based on semiconductors (like the one visible in the video in the initial part of this page). cooperating with the nonclassic devices listed above to accomplish the measurement process named inspection. reflecting a portion through 90° and transmitting the remaining. Their most common optical material is UV-grade fused silica. We are speaking of Neodimium or Titanium coatings, obtained by mean of electron-beam multilayer dielectric. Coatings with the additional feature of antireflection, matched to the wavelengths of operation at any air-glass interfaces, minimising transmission loss and ghost reflections. behaviour explicitly expected by Physics for systems of this kind. Bottling Controls. But, since a few years, there are also Vendors proposing to Bottlers as a retrofit the replacement of these devices with nonlinear semiconductors-based FlashPROMs. Mechanic HDDs' Medium Time Between Faults is short and approximately < 2 years and this really is the excellent reason for the change. In the meantime, Vendors are migrating the technology of the mass memory of the Bottling Controls toward what visible down, Solid StateDrives (SSDs), based on transistors. One more time, less space for mechanic or electro-mechanic components and increased presence of solid state non-linear components obeying Quantum rules, rather than laws of classical Mechanics or Electrotechnics. The, the most probable scenario we’ll see next in the medium term, is thinkably hinted by the figure down. Knowingly, Graphic Processing Units (GPUs) are an important component of today Image Processing and Machine Vision industrial applications. Shown one of the most powerful consumer-level GPUs of the World: its 6.3 billions of transistors are confirming we recently entered in a quite different Industrial environment, one destined to be dominated by quantum effects by mean of applications which have only started to be figured. Refer to the chart in the figure in the bottom, right side, showing the growth of computational power from 1900 til 2010. 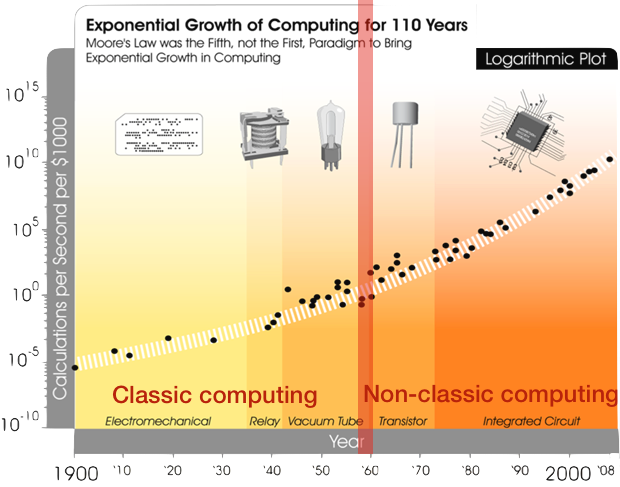 After nonlinear components introduction into computers, computational power increased ~1 million of billions of times. Nonlinear components diffusion into Bottling Controls is part of a generalised technological trend.